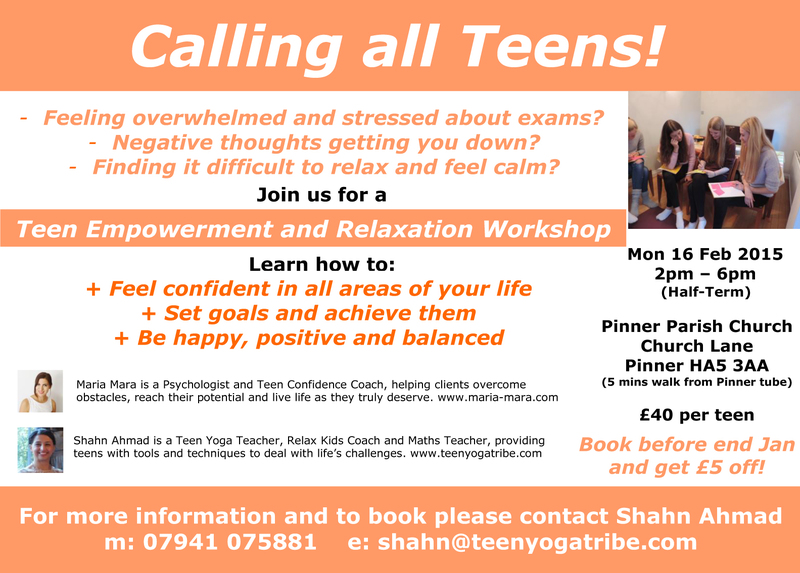 The aim of the workshop is to give teens tools and techniques to empower them to deal with issues such as exam stress, anxiety and worry, negative thinking, various teen emotions and including not being able to relax, switch off and unwind. All these issues have a major impact on health and well-being. 2. How stress affects learning/ exam revision, the causes of stress and the impact of stress on the mind and body and how to reduce stress levels. 3. Breathing exercises and movement to release stress and muscle tension, shift stagnant energy in the body and how to feel balanced, grounded and energised. 5. A guided deep relaxation exercise to let go, relax and unwind The workshop will be fun, interactive, engaging and will include practical exercises. The teens will leave with a toolkit of practices and techniques they can apply at home and school.